Rich and robust and a thousand times better than store-bought, this authentic enchilada sauce packs some serious FLAVOR! 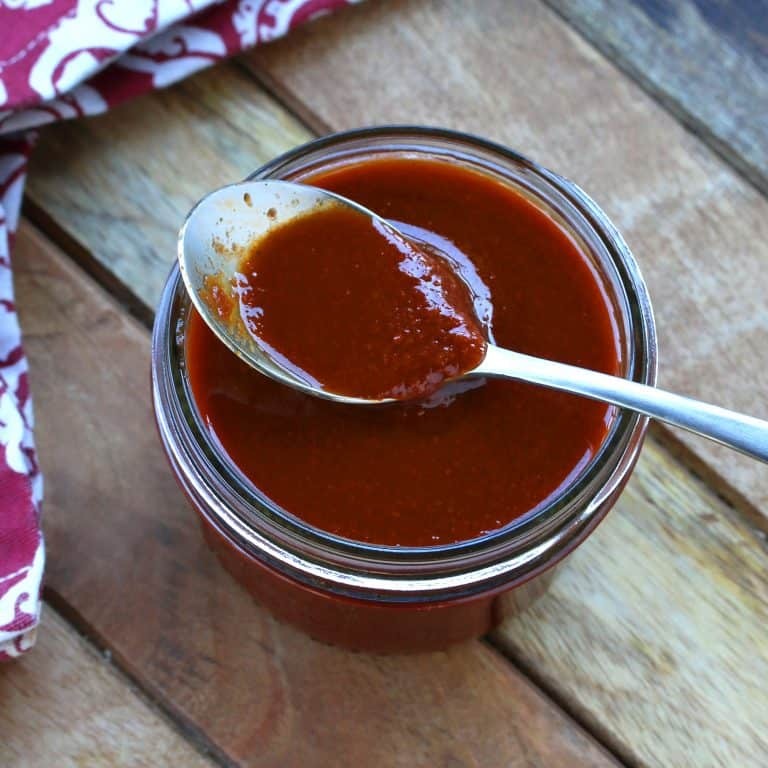 Not just for enchiladas, this sauce will take your soups and stews to a whole new level! That’s a phrase that fits most everything when it comes to cooking. And it’s most definitely fitting of enchilada sauce. 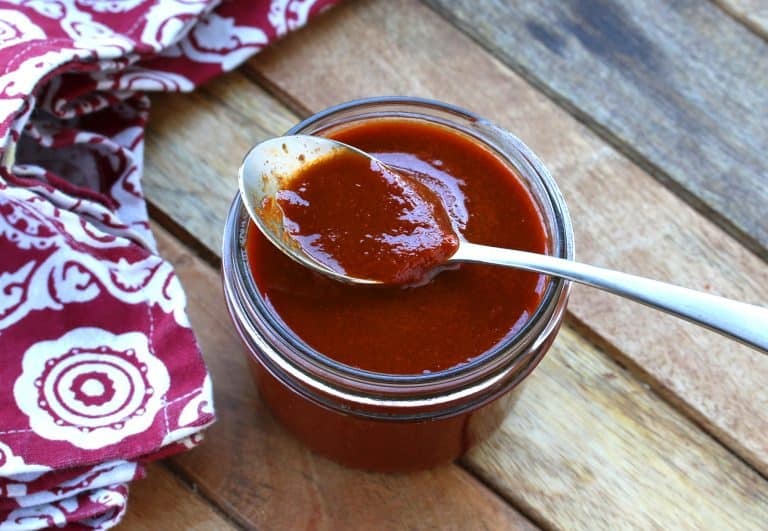 Rich and robust and at least a thousand times better than store-bought, this authentic red chile sauce packs some serious FLAVOR! Use dried whole peppers, not ground chili powder. 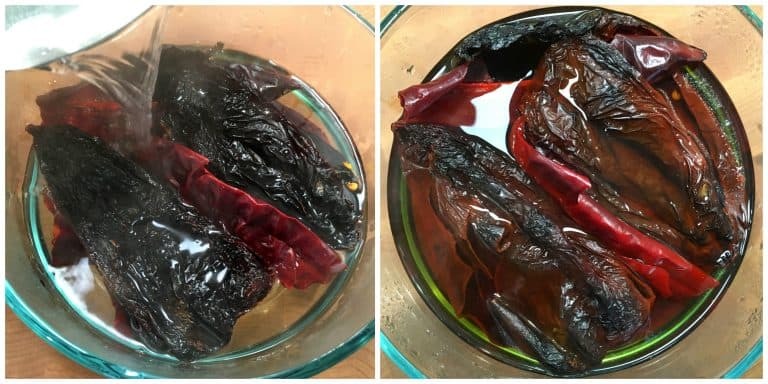 Using whole dried peppers, roasting them, then reconstituting and pureeing them will give you a much richer, more complex, more flavorful sauce with flavor notes you won’t get from chili powder. There really is no comparison. And adding a dash of smoked paprika won’t compensate for not using dried whole chilies and roasting them. Toast the dried peppers. This really enhances the flavor. Don’t scorch the dried peppers. If you scorch the peels while toasting them you’ll end up with a very bitter sauce. In the even that that happens, add some additional onion and a dash of sugar to take the edge off the bitterness. Use fresh garlic, not garlic powder. Roast it along with the peppers for optimal flavor. Use fresh onion, not onion powder. Roast it along with the peppers for optimal flavor. Say NO to flour. That’s used in some red chile sauce recipes to compensate for not using whole dried chilies. The whole chilies, once reconstituted and pureed will be the natural thickener for your sauce. Keep the flour for your tortillas, not your enchilada sauce. Cook the sauce. After pureeing and straining the sauce, cook it. As flavorful as the sauce already is, don’t skip this step, it is vital for bringing out the FULL depth of flavor of the sauce. Before it’s cooked you’ve got a bright red and flavorful raw chile paste (see below), but after it’s cooked the color darkens to a brownish red and the flavors deepen. Oh, how they deepen! The key to the best enchilada sauce is to select the best dried chilies you can find. 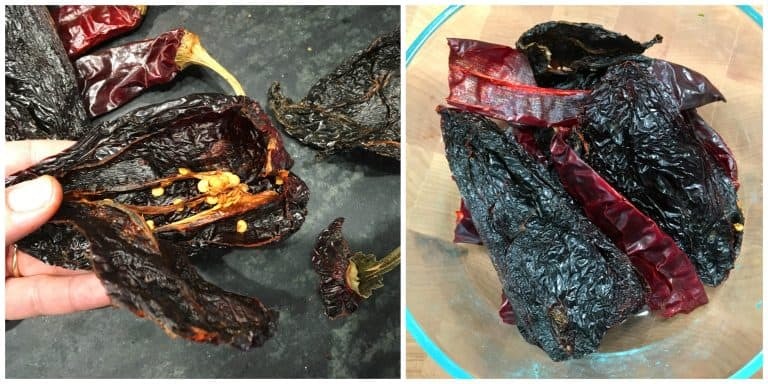 Most dried chiles I come across in grocery stores and online are poor quality. They’re old and brittle and flavorless. 1) They should be pliable and flexible (think a stiff version of fruit leather), not overly dry or brittle. 2) Their skins should be glossy, not dull. 3) They should have a good aroma, a little like dried fruit, not a dusty smell. Guajillo: Bright red, sweet with a touch of acidity with mild to medium heat. It’s one of the most commonly used chilies in Mexican cuisine with an earthy-sweet flavor and are great for adding body to stews, sauces and adobos. Ancho: Very mildly spicy with a rich fruity and lightly smoky flavor. They contribute a beautiful dark red color to sauces. Ancho chilies are poblano chilies that have been allowed to fully ripen to a deep red and then dried. Also one of the most commonly used dried peppers. Pasilla: Sweet, fruity flavor with medium heat. The name “pasilla” comes from the word pasas, meaning “raisins”, because of its deep fruity flavor. Arbol: Mild, earthy flavor and very spicy. While these don’t have a ton of flavor, they are your friends if you want to kick the heat up several more notches. *What are your favorite chilies to use in Enchilada Sauce? 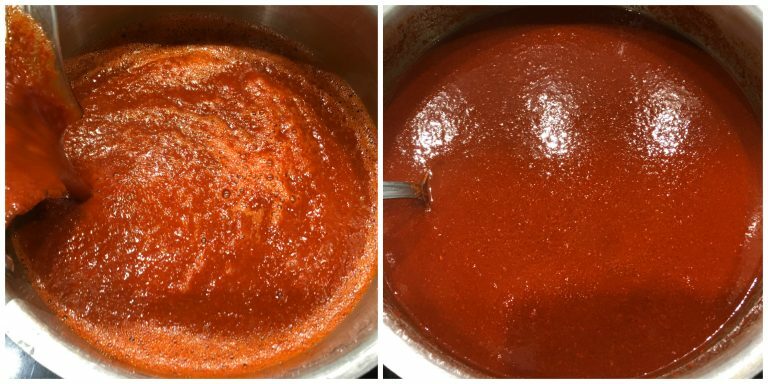 Ready to make some authentic Mexican Red Chile / Enchilada Sauce? Start with that all important step: Roasting! Heat a heavy non-stick skillet (I like to use cast iron) over medium-high heat. Don’t add any oil. Lay the dried peppers on the skillet and toast them for a minute or two on each, just until they become very fragrant. It’s better to under-toast than to over-toast them as they will become very bitter if scorched. Remove and set aside. Next place the onion, garlic and tomatoes on the skillet and toast until lightly browned. Note: Adding tomatoes is optional but I recommend it for curbing the sharpness of the peppers, balancing out the flavors and adding a touch of sweetness. Remove the stems from the peppers (using gloves if you’re using hot peppers), slice the peppers open and remove and discard all of the seeds and the membranes (contrary to popular belief, it’s the membranes not the seeds that are hot, the seeds are bitter). Place the peppers in a bowl. Pour the boiling water or chicken broth over the peppers, cover the bowl and let them sit for 20-30 minutes until soft. 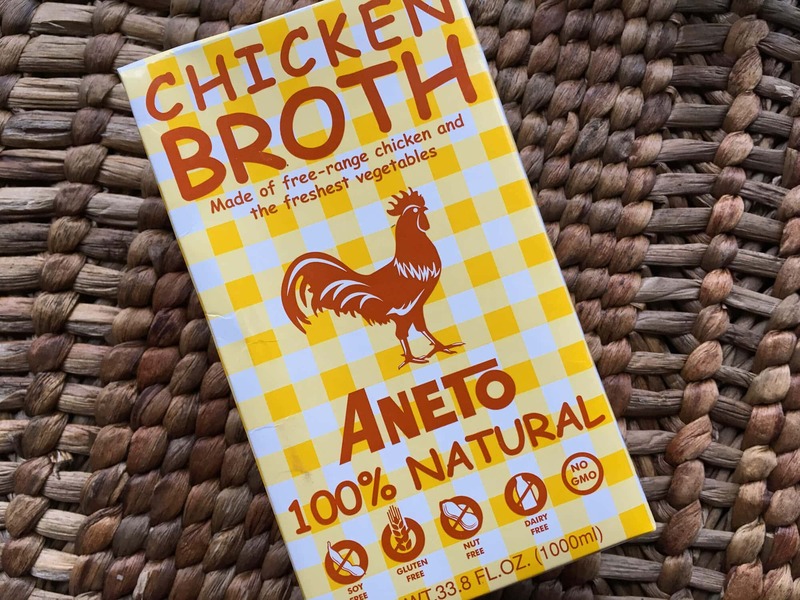 For chicken broth we recommend Aneto 100% All-Natural Chicken Broth imported from Barcelona, Spain. You can read more about why we love it here. It is hands down the BEST. 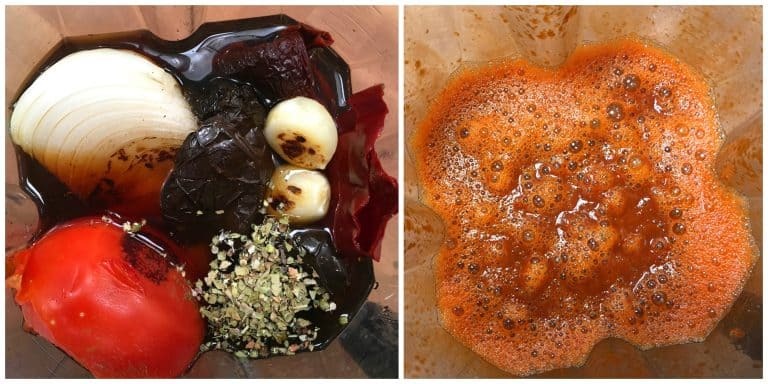 Place the peppers and their liquid along with the onion, tomato, garlic and all remaining ingredients (except for the chocolate if using) in a blender and blend until completely smooth. At this point determine for yourself whether your sauce needs to be strained. I use a Vitamix which does an excellent job of blending the sauce to a very smooth puree, so I don’t bother straining it. Heat a tablespoon or so of oil to a pot then add red sauce. Simmer it uncovered for about 30 minutes. Add a little more water if you prefer it thinner. The sauce should be the thickness of heavy cream. For an added flavor touch, add in a small piece of semi-sweet chocolate at the end and stir until melted. If the sauce is very bitter, add a touch of brown sugar. FINAL NOTE: Don’t expect this sauce to taste good on its own. It doesn’t. It’s when you add red chile sauce to or in other dishes that it works its magic. Store it in the fridge for up to a couple of weeks or freeze it. This sauce freezes well, so feel free to make extra so you have it on hand when you need it. I like to freeze it in ziplock bags, about one cup per bag so I can conveniently grab a bag whenever I need it. Cooking Suggestion: Use this sauce to make the Ultimate Pozole Rojo! Rich and robust and a thousand times better than store-bought, this authentic enchilada sauce packs some serious FLAVOR! Start with that all important step: Roasting! Heat a heavy non-stick skillet (I like to use cast iron) over medium-high heat. Don't add any oil. Lay the dried peppers on the skillet and toast them for a minute or two on each, just until they become very fragrant. It's better to under-toast than to over-toast them as they will become very bitter if scorched. Remove and set aside. Next place the onion, garlic and tomatoes on the skillet and toast until lightly browned. Remove the stems from the peppers (using gloves if you're using hot peppers), slice the peppers open and remove and discard all of the seeds and the membranes (contrary to popular belief, it's the membranes not the seeds that are hot, the seeds are bitter). Place the peppers in a bowl. Pour the boiling water over the peppers, cover the bowl and let them sit for 20-30 minutes until soft. Note: At this point determine for yourself whether your sauce needs to be strained. I use a Vitamix blender which does an excellent job of blending the sauce to a very smooth puree, so I don't bother straining it. Time to cook the sauce: Heat a tablespoon or so of oil to a pot then add red sauce. Simmer it uncovered for about 30 minutes. Add a little more water if you prefer it thinner. The sauce should be the thickness of heavy cream. Optional: For an added flavor touch, add a small piece of semi-sweet chocolate at the end and stir until melted. If the sauce is very bitter, add a touch of brown sugar. SEE NOTE. Store in the fridge for up to 2 weeks or freeze it for several months. I like to freeze about a cup of it per freezer bag so I can conveniently grab a bag as needed. 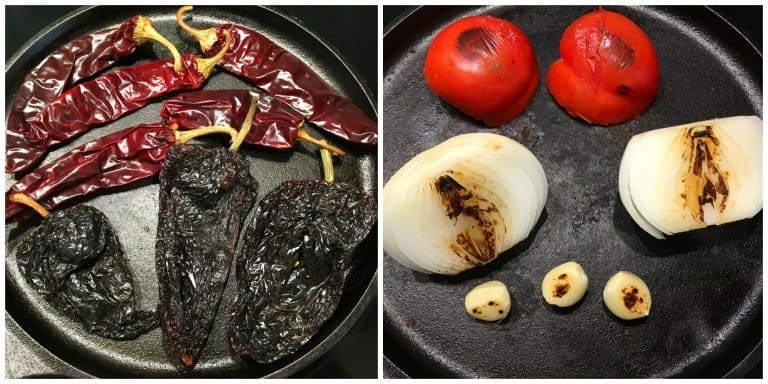 A universal complaint about homemade chile sauce is its tendency to taste bitter. That can be because of the peels of the chili peppers or because they were scorched when toasting them. Whatever the reason, if your chile sauce is too bitter for you, add a little brown sugar. NOTE: Don't expect this sauce to taste good on its own. It doesn't. It's when you add red chile sauce to or in other dishes that it works its magic! I love an awesome enchilada sauce, thanks for sharing this delicious recipe. I love the idea of adding some brown sugar to get rid of the bitterness. You are so thorough (and very authentic) in each and every step. I’ve spent my share of time living in Mexico and I would not make this sauce any other way. I shudder when I see other posts which do NOT even mention “seasoning” the sauce by frying it. Years ago, the first time I saw my friend do this I was horrified! Why would anyone want to “fry” this sauce? It’s so important! Also, I would encourage folks to invest a very small amount to buy a comal to roast your peppers. I think I paid $10 for mine at a Mexican grocer. Thank you for posting this recipe! I signed up for your emails too because I love the way you write your recipes! Thanks so much, I appreciate the compliment and thank you also for subscribing! This looks and sounds SO delicious!! I can’t wait to try this recipe!! YUM!! Love this sauce – I have been looking for a good homemade one for ages!! It’s always great to have staple recipes like these. This one looks so delicious! I’m certain I’ll be using it again and again. I can’t wait to try this! Such a great tip to make a huge batch and freeze it to use in the future. I’m always up for making things easier in the kitchen at dinner time. Homemade sauce always has the best flavors! Definitely want to keep this on hand! This looks so authentic. Seriously the real deal. Whoa this looks perfect! 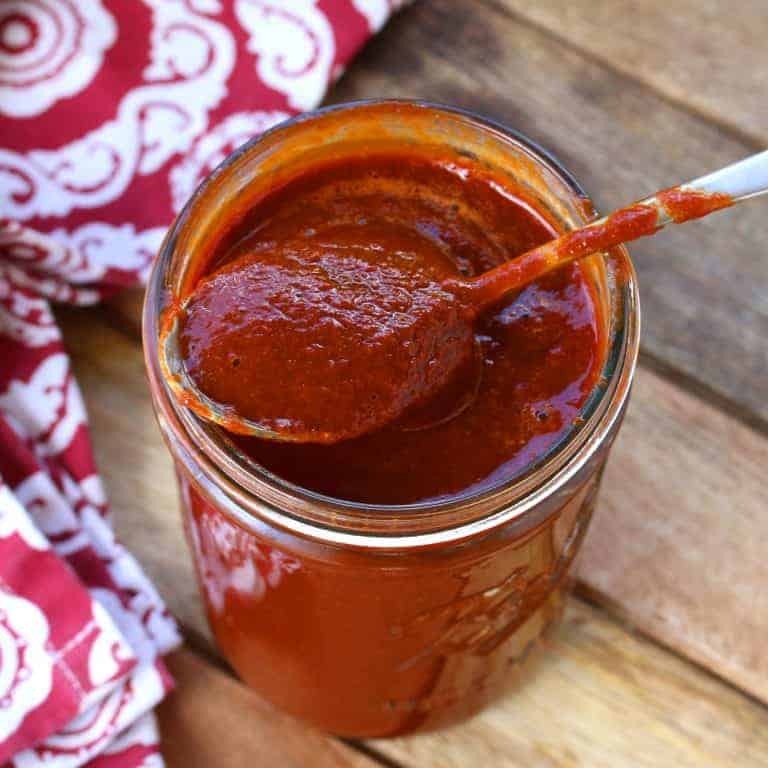 Homemade sauce at it’s best, this is absolutely a winner! I can’t wait to smother my enchiladas in this sauce! Yum, I need to try making my own sauce soon! Love homemade enchiladas! This sauce looks fantstic! My husband will go crazy over this! He loves everything chili. YUM!! This sauce sounds incredible!! Looks delicious and so easy to make! Love this sauce! Love it when I can toss out the jar and make homemade! Nothing beats a homemade sauce. This one makes me want to smother some enchiladas right now! This tastes WOW! You showed me everything I had been doing wrong. This is a total game changer. Great tutorial and recipe, thank you! I’m so glad, Nathan, thank you! I’ve never made my own enchilada sauce, but this is going on the menu. So amazing!!! This sauce is so rich and flavorful – you’ve really built a ton of flavor into this recipe! I can’t get enough!! This makes me want to go buy some chilis right now. Homemade is ALWAYS better! What a delicious low calorie sauce! This sounds amazing! I need to give this a try! This was outstanding! I made it as written, adding a few arbol peppers because I like a bit of heat. 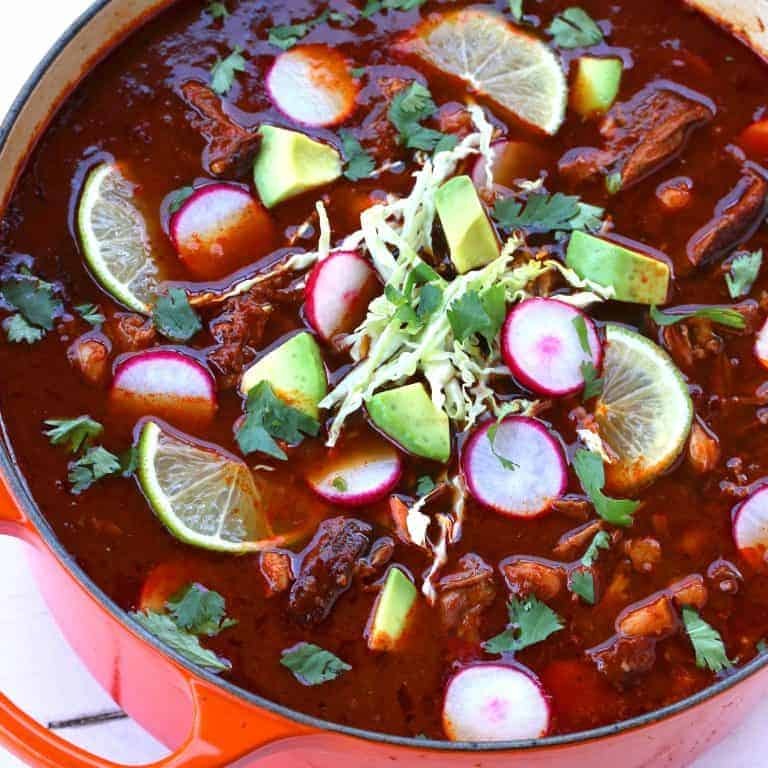 Used this sauce in your Pozole Rojo recipe and it was incredible, so much flavor! Thank you! I’m so happy to hear that, Terri, thank you! This has me seriously making a list to make enchiladas tonight! Homemade sauce is SO much better than store bought! Kimberly, I made this last night to go with your Pozole Rojo and all I can say is WOW! My family raved about it! I ordered the dried chilies you recommended and they’re awesome, so much better than the ones I used to buy at the store. This recipe is a keeper. Next I’m going to make and freeze a bunch of this enchilada sauce to have on hand. Keep these delicious recipes coming! That’s awesome, Cami, I’m so glad you made and enjoyed both of the recipes, thank you! Your comment about ‘homemade’ being better than store bought means a lot to me! So why the Aneto 100% All-Natural Chicken Broth from Spain? We freeze chicken bones until there are the remains of three chickens and then make stock in a pressure cooker. Add onions, celery, carrots and pressure cook for 45 minutes. Presto: 8 cups of (almost) free chicken stock. Love your recipe for the Enchilada Sauce. Thank you!! I never dreamed I would get a response from you…thank you. I do understand your need for an extensive supply of really good stock. We don’t have these options on Prince Edward Island where we live so we make do with homemade. I don’t know a lot about chile peppers – they don’t get this far north in any regular quantity or understanding – and I must thank you for your most informative explanation of the various kinds and their usage. I’ve made this twice already, this time a double batch! It’s SO GOOD. You really hit the nail on the head. Excellent recipe, thank you for sharing! So awesome, Tim, thanks for the feedback! Thanks so much for sharing this! Can’t wait to make my own authentic enchilada sauce at home. I am so happy that i tried your recioe instead of going with a flour based. I am pleasantly surprised at how good the taste is. I love this recipe. I made this today and it was perfect! My 1st time making enchilada sauce at home. I’ve always bought canned sauce. This doesn’t even seem like the same thing. I usually get bored & loose interest in blog recipes but this one explains things very clearly & doesn’t add a bunch of unnecessary info. I hope freezes well because I made way more than I needed & I don’t want an ounce of it to go to waste. On a side note I aways make my own chicken broth because I can’t find a store bought one I like but I’m looking forward to trying the one suggested. I’d like to can this sauce to make it shelf stable. DO you have any recommendations for this? Great recipe! I poured it over roasted cauliflower and sweetness potatoes, topped with avocado and a squeeze of lime! I love this sauce! I was wondering if I could pressure can it? Hi Berenice, in step 3, “all remaining ingredients.” Happy cooking!